I guess the first thing is to wish all readers a ‘Happy New Year’ from Spain and hope that 2018 will bring happiness, health and prosperity to all mankind. Quite a normal statement that is repeated year after year by most citizens around the world that proves that deep down inside humanity has not really changed so much. Catalonia held center stage as usual and a totally unexpected event took place. The formation of a new separatist group within the region that named itself ‘Tabarnia’. 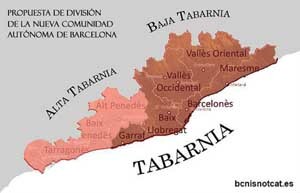 Barcelona including its metropolitan area joined forces with Tarragona to claim a divorce from the regional government. They claim that theirs is the prosperous, industrial and bilingual Catalonia that is dead against independence and will fight to gain a just fiscal treatment from the Catalan government. True or false? It so happens that the 28th of December is the Spanish version of April fool’s day and the news was a hoax. However, it did have an impact! Regional elections took place as planned on the 21st and the results were astonishing although predictable. Contrary to the illegal – always related to the Spanish Constitution – referendum on the 1st of October that gave the impression that all Catalans were determined to gain independence the majority votes were for the candidate of the constitutionalist Ciudadans (every-which-way party), Ms. Ines Arrimadas although were not enough to form a majority government. Her surname by the way means ‘leaning’. Very appropriate. Without going into detail, as most of the buildup was reported in previous essays, the majority of Catalans still voted for the separatist conglomerate of parties versus the constitutionalist lot. Meanwhile, the exiled, for use of a proper description, ex-President, Sr. Carles Puigdemont remained in Brussels drumming up international support to return as the true triumphant leader of Catalonia. Suffice to say that everything has changed for nothing to change - in theory - although in practice the whole Catalan political scenario has been turned on its head once again. We’ll see what happens as the end of the year festive mood dies down. Other news, although important and even dramatic is briefly as follows. Climate change may be a top topic discussed at high level of world institutions with a diverse and monumental amount of reports and conclusions but what is obvious is that change is taking place. Spain suffered from a severe drought that continued throughout most of autumn and the beginning of winter. Most of the reservoirs and rivers dropped to levels that threatened water supplies throughout the country including the Northwest that is renowned for being one the wettest. No need to expand on the effects on public and commerce, especially the agricultural side. Fortunately, along came hurricane Bruno that has started to, pardon the pun, turn the tide of a drought hardly experienced in the past. As a reminder, Spain suffered from severe fires that burned down millions of hectares of forest. One can imagine the next phase of flooding that is now taking place in some areas of the country. We all enjoyed the Christmas speeches and well-wishing especially from King Alfonso VI whose watered down mention of Catalonia was that of harmony and togetherness as a strong and united nation. Official figures show that the economy continues to grow and predictions for the following year are similar. Tourism was up by about 10% on previous year. Inflation is at around 1.9%. Controllable. Job creation is the government’s main objective for the coming year despite the Catalan situation that is suffering from the continued loss of business as more and more companies transfer HQ’s to other parts of Spain. We’ll see! Finally, once again, we have Brexit and the never ending saga of ‘Citizens Rights’ that is the main bug for Brits in Spain. Mrs. May has sent an open letter to those resident in Europe assuring them that the latest round of negotiations confirms the desire of both the United Kingdom and the European Union to safeguard the present conditions of those already living in Europe. The response from many of the British organizations that are fighting for their rights and have been studying the small print have rejected the letter. As yours truly is one of the affected I’ll just leave it there except for the reminder that Spain is home to over 300,000 British citizens including many pensioners and another several thousand that have property and enjoy long summers in the sun. Add the number of tourists, that are that are top of the league and the last thing the Spanish government wishes is to upset the apple cart. Once again Catalonia votes and Independence wins - The background to the election and consequences for Spain are explored. Is Spain in political danger now?